How to build a barbecue grill and table combo | DIY projects for everyone! One of the best things in life is enjoying a delicious barbecue fresh off the grill with family and friends. Add beer or your favourite cold beverage while you grill and swap stories. 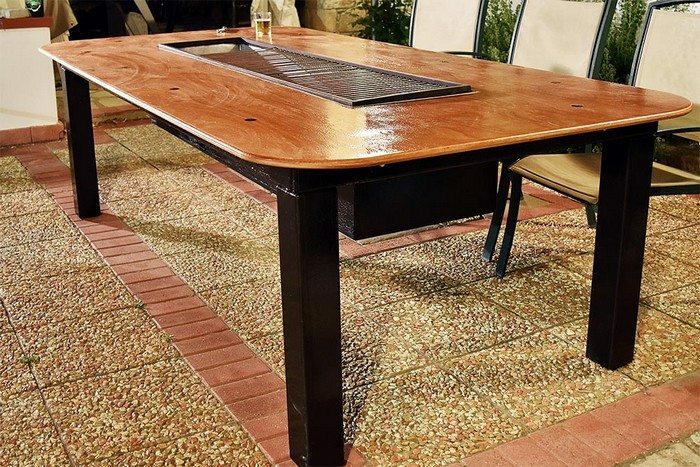 If this is your idea of a good time then this DIY barbecue grill and dining table combo is a must-have for you. Take your barbecue dinners to the next level with this barbecue grill and dining table combo! This piece of DIY furniture is not the first of its kind but it is a build that answers all your needs when it comes to outdoor grilling. It has a strong and sturdy frame that can easily accommodate 12 people at the same time. The grill is in the middle and runs the length of the table, which makes it an easy reach for everyone seated around it. What about the heat, you say? The barbecue pit is composed of a wooden box with insulation that’s lined with cement board – to keep the heat contained at the center. The metal legs of the table are also covered with plywood to further protect diners, in case the heat spreads outward from the grill after long hours of grilling. Now if rain and snow are factors to consider, we’ve got it covered. Just make sure that you use water-resistant plywood for this project, then you can expect your table to last a long time! 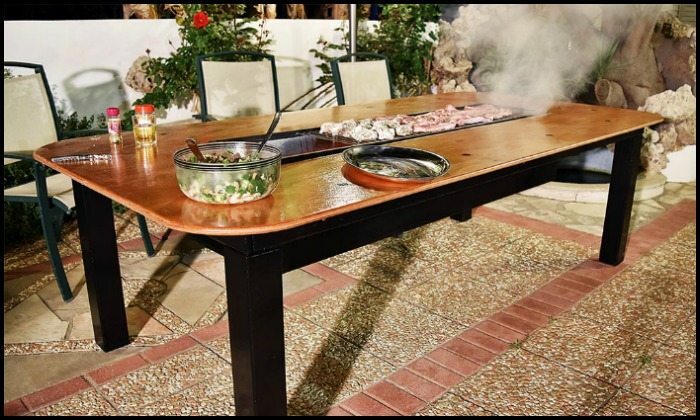 With this DIY barbecue grill and table combo, no one is left out of the conversation by having to man the grill on the side. Everyone can watch the food on the grill while swapping stories. Everyone can relax, laugh and lounge comfortably in their seats while the food is cooking. Life couldn’t get any better than this! Know what materials you’ll need and learn how to build one yourself through Make it Extreme’s tutorial below now! Size: The capacity of the table should be for 12 people, so the large length of our manufacture (250cm x 120cm) needed a metallic frame from the inside in order to prevent any deformations because of the excessive weight of this table. Metallic Frame: We made a metallic frame using a square hollow section known as square tubes 60mm x 60mm, 220cm length and 100cm width with four legs 73cm tall. At the central point of this frame, it was made a socket to place the barbecue. Then, the whole top surface of the frame was lined with cement board which is used for fire safety. Regarding the final surface of the table, we used marine plywood which is water resistant as well as to the rest of the frame, we used the same kind of wood. At the central point under the table, a wooden box was made that covers the barbecue in order to protect the user from the high temperatures that are being increased. Thus, to increase the performance of our structure and to protect this wooden box, we lined the internal side of the box with Rockwool, which is heat insulating material and then we also placed cement board for fire safety. Barbecue: The barbecue has the potential to be removed and put back to its place in order to be able to be easily, cleaned. The edge of the top surface remained to the natural colour of the wood while the rest of it became black. Then, the whole table became clear varnished. Additionally, we should mention that on the days, when the table won’t be used as a barbecue, we made a wooden cover to be put on it in order to make it seem as a common table. Testing: After completing our manufacture and testing it, we remained satisfied from the outcome as there was no increase of the temperature in spots where we needed to be heat insulated. We were pleased realizing that with a very few coals, we could cook our food on our barbecue table for three hours or may be more. The only expected problem that we faced was the smoke that was caused by the cooking. Although, this may lead us to another manufacture, which will be an extractor fan to collect the smoke that will be gathered by the table. Previous articleMake a DIY outdoor race car track for your kids! Dis you use 1/2 or 1/4 cement board? Great, build – thanks for sharing!